When you come to audition for Opera Company of Philadelphia, I want to hear your best work, and I want you to succeed. Make the most of your audition. Present yourself in the best way you can, putting your strengths forward. Afterwards, recognize the intrinsic value of auditioning, and learn from the experience. Regarding the audition itself, I have three pieces of advice to offer. • Consider your audition repertoire. Are you starting with your very best piece? Singers spend so much time and money preparing for auditions, and then give their power away by allowing the person hearing them to select the first piece. Some auditioners may want to choose, but the majority will not. Since your first piece may be all we have time for, I want to hear what you do best. Your selection also shows me what you consider your strengths to be. • Be careful not to sing a piece that shows what you cannot do. If you only have that high F on some days, don’t sing the Queen of the Night; if you have trouble with slow, sustained passages, don’t sing “Vissi d’arte.” Along those lines, don’t show me what you think you’ll be singing in ten years. Wait until you are really ready to sing that heavy repertoire. Sing it in the practice room, but not for your audition. I need to know what you can sing now. • Have something to say when you sing. When you worry only about having a beautiful tone, you neglect the performance aspect of auditioning. I don’t mean that you need to be all over the stage and act the piece out, only that you must tell the story and have real depth of character. Have an opinion about the piece-your own opinions. It is obvious when you are simply mimicking what your coach has given you to do. It is not enough to splash on the interpretive paint two days before your audition. As a singer, you must believe that you have something to say, or you wouldn’t be choosing a career in opera. You cannot wait until you are in a production to show what you have to say; you have to show it at the audition. So, now you are prepared to audition for Opera Company of Philadelphia. How do you get heard? I should say right off that I will listen to anyone who lives in Philadelphia. It is your home, and you deserve to be heard here. It helps me, as well, to know who is in my backyard. Also, I make it a point to hear young artists in respected pro- grams around the country. I travel to summer festivals and other companies regularly, as well as listening to singers at a colleague’s request. Include dates and places. I repeat, include dates and places – where you have sung, and when. If I don’t see the dates of performance on the same line as role, opera title, and company, I will assume you have not done anything recently, and that could compromise your chance to be heard. 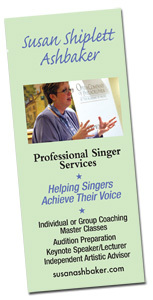 For young and less experienced singers, include the names of people you have studied with. This is a small world, and I may want to call one of those people for a reference. Therefore, it is important to list people who know you and your work well. Do not put down someone who heard you sing in a masterciass, or a director whose chorus you sang in. Let me know what your skitls are. What languages have you studied? Do you play the piano? If you have studied an instrument for a significant amount of time, that gives me a lot of information about you and your potential musicianship. However,only put it on the resume if it is musically applicable. I am not interested in knowing that you enjoy Chinese cooking or macrame at this point. Do not lie or stretch the truth on your resume or bio. As I indicated before, it’s a small world. With e-mail, it is even smaller. Opera Company of Philadelphia reviews resumes monthly. We look for local applicants, and for singers who are appropriate for roles we need to cast. After resumes are reviewed, we will contact you to let you know whether or not we can schedule an audition for you at that time. If we are able to hear you, the audition coordinator will let you know what you are auditioning for. I prefer to audition singers for specific repertoire. For example, if we’re doing Ariadne auf Naxos, and I need a Composer, I will let the singer know that I will want to hear that aria. If you don’t have that aria, ask if you can sing something similar that you do know and are comfortable with, such as Octavian. Ask yourself: Did I sing well? Was it my present singing? Did I present myself in the best possible way? Do not judge your audition by whether or not you get hired. Recognize the intrinsic value of performing auditions. Your audition will most likely be held on our mainstage for role auditions, and in the rehearsal hall for more general auditions. Offer your first piece, and perform the audition with the previous suggestions in mind. Afterwards, learn from the experience by performing a self-as- sessment. It is not my policy to provide feedback. I do not believe that 10 minutes is enough time to give you solid advice on your development. Ask yourself: Did I sing well? Was it my best singing? Did I present myself in the best possible way? Do not judge your audition by whether or not you get hired. Recognize the intrinsic value of performing auditions. Your support network is crucial to your ongoing assessment process. Your network team should include your teacher, coach, and others whom you trust and respect. These people need to give you honest feedback on a regular basis, and not simply tell you that you’re wonderful all of the time. If a coach from your team cannot play your audition, consider asking a colleague to attend your audition as an observer. (Be sure to clear this with the company first.) They can provide you with feedback specific to that audition. Finally, realize that a good audition does not always result in being hired. Usually, it has to do with circumstances that are beyond your control and separate from how I like your voice. It may be that another role has already been cast, and your voice or look may not work with that singer. Or, since we plan repertoire so far in advance, it may be that I have nothing immediate to hire you for. However, if I like how you sing, I will keep you in mind as future seasons develop. Half of the time, roles are cast with singers we already have relationships with, or whom we have heard in previous auditions. Do not judge yourself too harshly if you are if you are not hired from your audition. Consider the numbers: I get hundreds of audition requests every year. I can hear 6 singers per hour, and if I hear 4 hours of auditions that is 24 singers for each day. 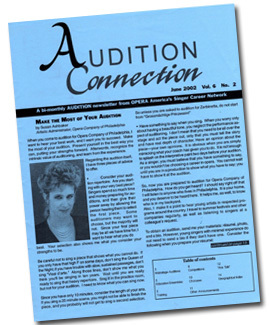 I do about 10 days of auditions per year, which adds up to 240 Singers. I need to fill between 40-60 roles each season, and at least half of those are cast prior to your audition. We have 10 minutes together, and we need to respect each other’s time. It is my job to hear you. It is your job to make the most of your time and learn from each experience.